IWASSA Co.: Add the "Google Chrome" allows modifying files without assistance programs. 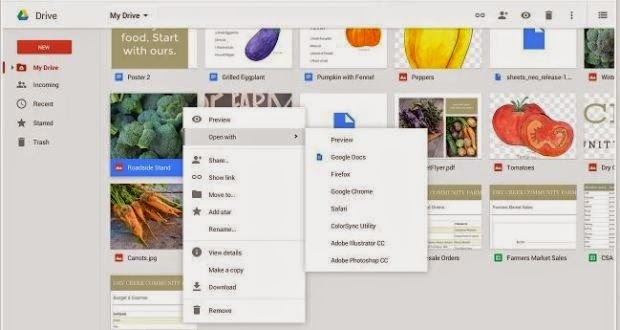 Add the "Google Chrome" allows modifying files without assistance programs. Although multiple cloud storage services of most companies, but the competition between them has intensified, as each company has become poses advantages and offers its services and storage, for example, provided by One Drive "Microsoft, service Dropbox famous .. and others. The two rival Google Drive service offered by the company "Google" They are working to develop dramatically and eloquent effort, to suit all user needs. And it seems that the "Google" has transformed the service from the cloud storage platform to work where you can create files and modify them, this after the last update that launched the company. However, there is what is causing inconvenience for some users, and when stockpiling of some files, and then refer to them, they will need assistance programs to open it or run it, so the Google Inc. launched add the famous Google Chrome the browser helps the user to open files PSD, for example, and it directly through browser and Web applications without having to download or run programs by, for example, or other Kalfotoshob. And to open any file that needs to be programs to open it just press the right mouse button on one of the files that you want to browse and select from the menu option "Open With" or "Open With," which, in turn, run the file and reviewed in the addendum without exit. Addition also supports audio editing and image and video programs stirring three-dimensional 3D and others. To download the addition of Google Chrome store click here.